Home 1950s 1960s Peanuts Retro Advertising retro TV You're a Ford Salesman, Charlie Brown! A lot of people think that A Charlie Brown Christmas, which originally aired in 1965, was the first time that Charles Schulz's beloved Peanuts characters appeared in animated form on the small screen. 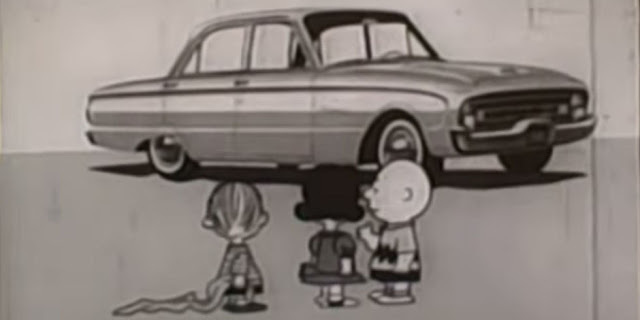 But it was actually in the late '50s and early '60s that the American public got to see Charlie Brown and the gang brought to life for the first time, when they were commissioned to promote the new Ford Falcon. I'm currently half-way through reading the David Michaelis biography of Schulz, called Schulz and Peanuts, that was published in 2007--a couple of years after Schulz's death--and this advertising campaign was a revelation to even me, a lifelong Peanuts fan since I was about three years old. So let's take a look back at this cute and charming campaign that was released during the Mad Men golden age of advertising. The comic strip had been around for a decade by this time--first as Li'l Folks in 1947, which evolved into Peanuts by 1950. By the late '50s, the income that Schulz was making from the success of his strip was booming--not just from drawing it, but because he was now getting licensing deals from companies. A manufacturing company called Hungerford Plastics Corporation had started producing the very first figures of Peanuts characters--made of polyvinyl--in 1958 (needless to say, an unopened figure in mint condition is worth a small fortune today.) Hallmark began their relationship with Schulz in 1960, introducing Peanuts greeting cards and paper goods. But the biggest deal offered to Schulz at this time was when the Ford Division of Ford Motor Company approached the cartoonist for the exclusive rights to have the Peanuts characters promote their new compact car, the Falcon, across all advertising channels including television, print ads, and billboards. Schulz worked closely with Ford's advertising agency, J. Walter Thompson, even consulting on the script, and had the final approval on the children selected to voice the on-screen characters. 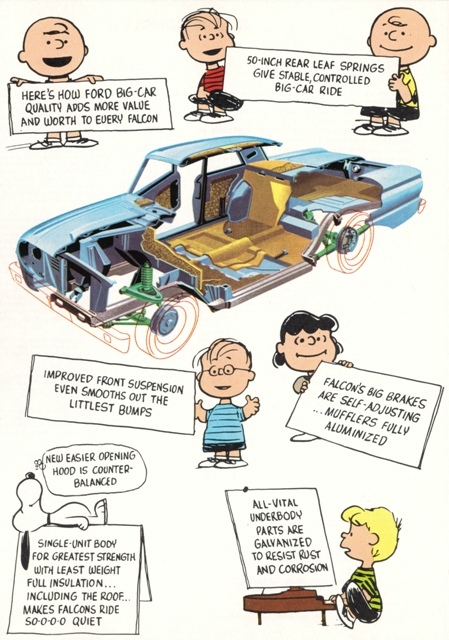 The Falcon, which was touted as a compact car with a lot of space and great gas mileage, was a huge success for Ford, no doubt due to the Peanuts partnering. And no matter how many other deals Schulz was offered through the years, he regarded the Ford licensing as a huge milestone. 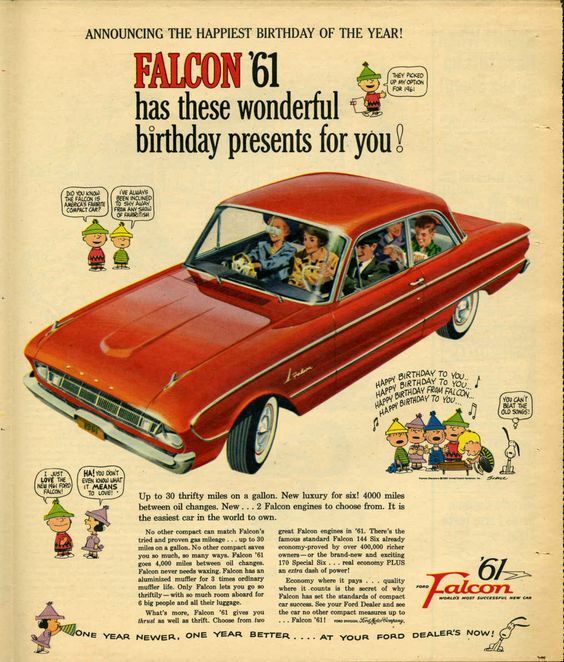 Here's all of the Ford Falcon/Peanuts commercials that I could locate on YouTube, including a few clips where characters introduced The Tennessee Ernie Ford Show in the early '60s. The one huge difference I notice between these commercials and the Peanuts TV specials is how Linus is portrayed; instead of the mature and worldly-wise philosopher we came to know and love, he actually comes across in the Ford commercials as very innocent and child-like. Lucy isn't quite the crabby boss lady yet, either. And Charlie Brown isn't being called a blockhead or having footballs yanked away from him! Also, if they wanted to go for true Peanuts authenticity, the announcer would be speaking in that infamous "wah wah" sound. 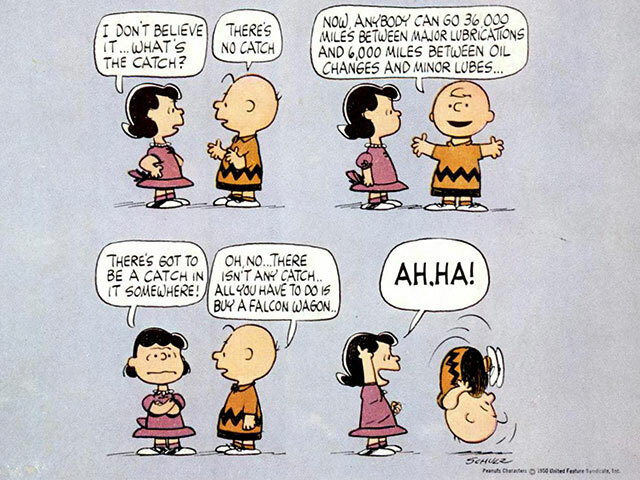 I wouldn't believe anything Lucy Van Pelt tells me. She can't be trusted to hold a football, much less sell me a Ford. Ha ha! Well, she didn't have a prominent role in these spots and the ad campaign WAS pretty successful.